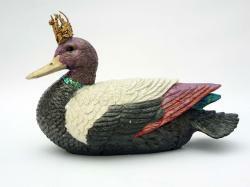 I would like to receive occasional information and updates from The Decorated Duck and jumblebee. 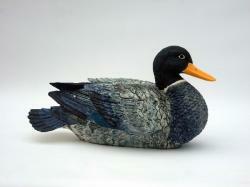 “The Decorated Duck” project features around 50 beautifully and uniquely decorated ducks, all sitting on bespoke copper and wooden stands. 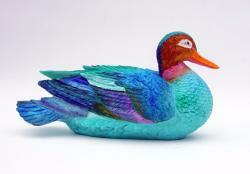 Artists & designers, and staff & patients from The National Spinal Injuries Centre at Stoke Mandeville Hospital, have decorated the ducks to raise money for the Arts Rehabilitation Programme which offers activities and events for long-term spinal patients. 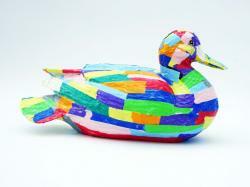 Creative art therapies can have a healing and positive effect, promote relaxation and provide a means of self-expression which can reduce anxiety. 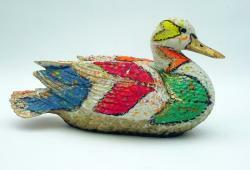 Regular arts and crafts workshops include pottery, print making, mosaics, textiles and marbling; and we like to engage local communities in our arts projects. 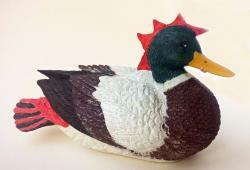 After a successful exhibition at the Waterside Theatre in Aylesbury - the auction is in full swing - please keep bidding to buy your favourite ducks. 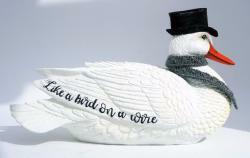 The Silent Auction is live from Friday 15th September to 4th October and everyone is welcome to take part and raise money for Arts Rehabilitation for people with spinal injuries. 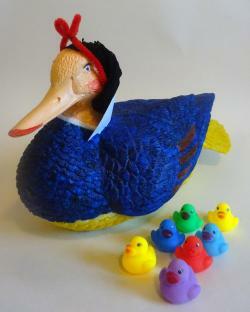 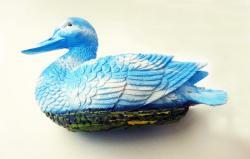 These very special ducks will make an eye-catching talking point in any home or public area. 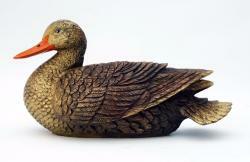 Ducks measure approx 36 cm from bill to tail, and weigh 1.6kilos; they are not weatherproof, so should not be displayed outside. 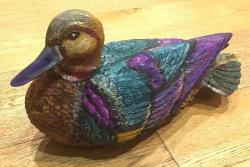 Collection from the NSIC, Stoke Mandeville after the auction has completed is preferred, or they could be posted at extra cost. 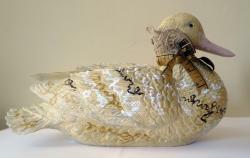 This intricate Victorian lady duck is influenced by the beautiful embroideries of Austrian seamstress Agnes and is created by artist, Juliet Eccles, using paint, tape and lace. 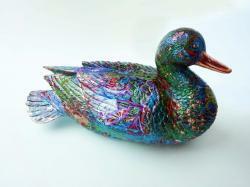 Photo updated 23/9 to show completed duck! 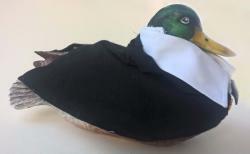 D8 - Duck and Cover! 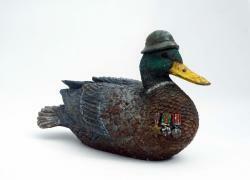 Created by Tim Dutton, a muddy duck straight from the trenches, complete with helmet and medals. 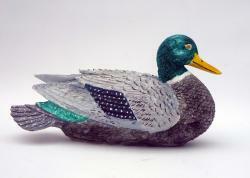 Flashes of metallic blue highlight this beautifully painted duck by artist, Max Pickering. 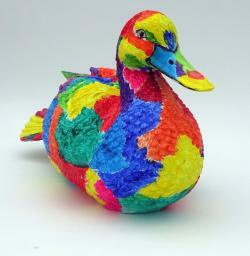 Far-out colourful duck that stands out from the muddy crowds, created by artist, Nicole Williams in acrylic paints. 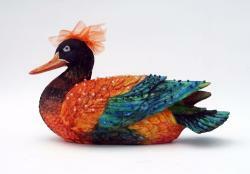 Elegant colours and a pretty hat created by Ann Walkinshaw using Indian inks, beads and fabric. 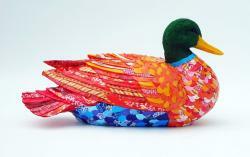 Layers of coloured patterned paper show off beautiful textures and details created by artist Andrea Brewer. 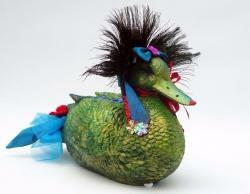 A country style of her own, glass artist Claudia Phipps had decorated this duck with fabric patchwork and plaited hair under a magnificent feather headdress. 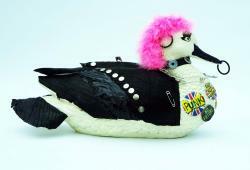 With pink feather hair and a studded leather jacket, this duck by print-maker Ann Burnham, is a pretty tough punkie duck. 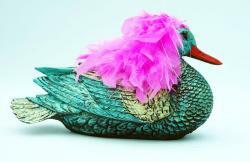 A duck of flamboyant excess and lots of fun, artist Tom McNulty created his alter ego with pink feathers, paint and false eyelashes. 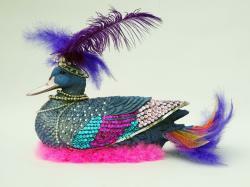 Inspired by his flamboyant namesake, this is an outlandish duck of two sides, created by Lucy Robinson using acrylic paints and glitter. 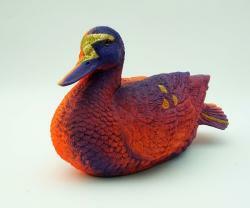 Splashing in the paint pots has left this duck with a coat of many colours. 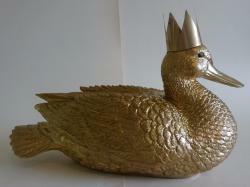 Decorated by Ellen using acrylic paints and gold. 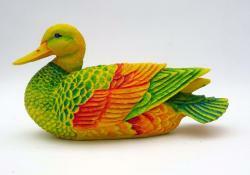 Gorgeous citrus colours decorate the feathers of this edgy bird. 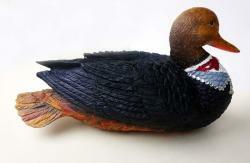 Painted by artist Yeshe Spooner. 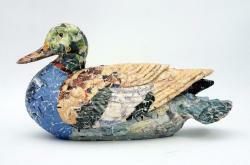 Beautiful mosaic patterns made from paper bird pictures give this duck a sophisticated and unusual image. 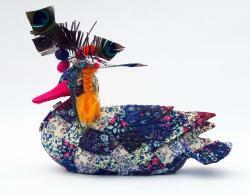 Created by artist Julie Lue. 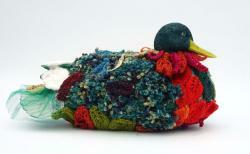 Stunning lady duck with a great taste in jewellery. 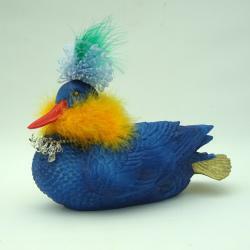 Blue feather headdress set off by a specially made silver bracelet and Swarovski crystal. 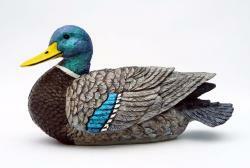 Created and painted by jeweller Jane Pomiankowski. 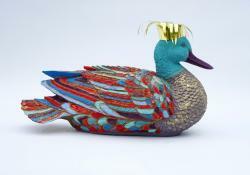 This glorious stately duck shows off her painted feathers decorated with silver kid leather, gold thread and beads, created by artist Patricia Griffin. 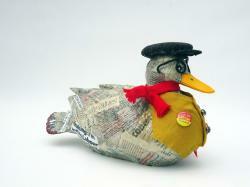 Created by Vivienne Gordon, "Left-wing Duck" is a political statement with a difference and an ironic sense of fun. 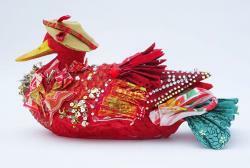 Made with newspaper, ribbon, wire, fabric and buttons. 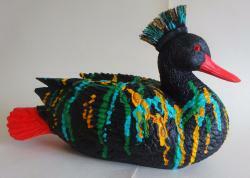 Decorated by spinal patients with a bit of help from OT student Arminah, this duck shows his Oriental colours and beautiful Chinese patterns and characters. 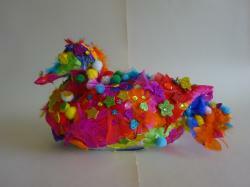 Paint, paper and sequins. 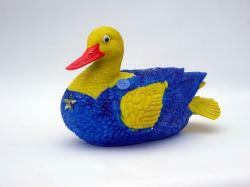 A true celestial duck reminiscent of a starry night painted with acrylic paints by the Year 13 Art Ambassadors from Aylesbury High School. 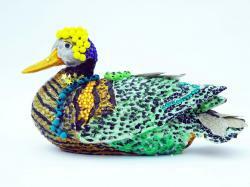 A show-off duck with exotic plumage that will grace any jungle, decorated by Sue Renshall with paper, paints, feathers and pom poms. 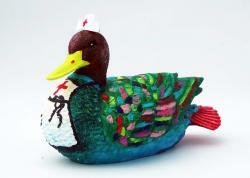 For all children at heart everywhere, this Minion inspired duck was painted by St. Francis Ward in the NSIC. 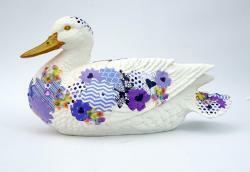 Calming, cooling and tranquil blue and purple colours created with patterned paper and paints give a porcelain effect to this graceful and refined duck, created by artist and NSIC consultant, Alison Graham. 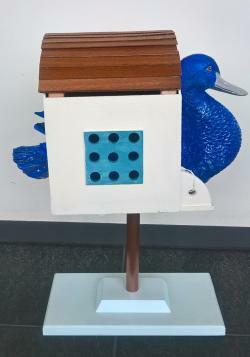 Bring the countryside into your home with this refreshing portrayal of Aylesbury Vale scenes under blue skies. 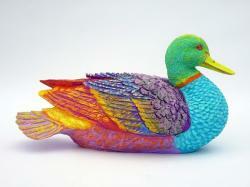 Created by Matt Walker using paints and laquer. 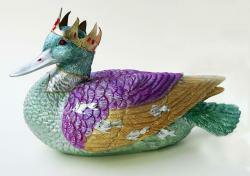 Peacock feathers, metallic paints and ribbons and bows have made this grand lady duck into something sumptuous and special. 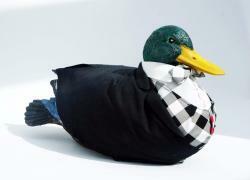 Created by fashion designer and dress-maker, Juliet Hamilton. 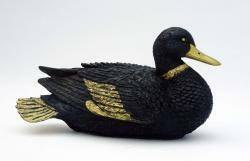 D50 - Homage to "Wheelpower"
Exquisite and ornamental paint effects with gold and copper leaf combining patterns and details of wheels and spokes to achieve a highly original and stylish duck. 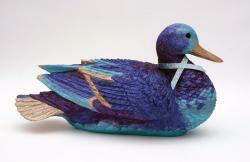 Created by Paralympic Games artist, Rachel Gadsden.